We found that there are restaurants around Boston that are thinking local and sustainable but aren’t advertising it loudly. One of them is Somerville’s Field & Vine, quietly crafting excellent food in a cozy space tucked away in Union Square. 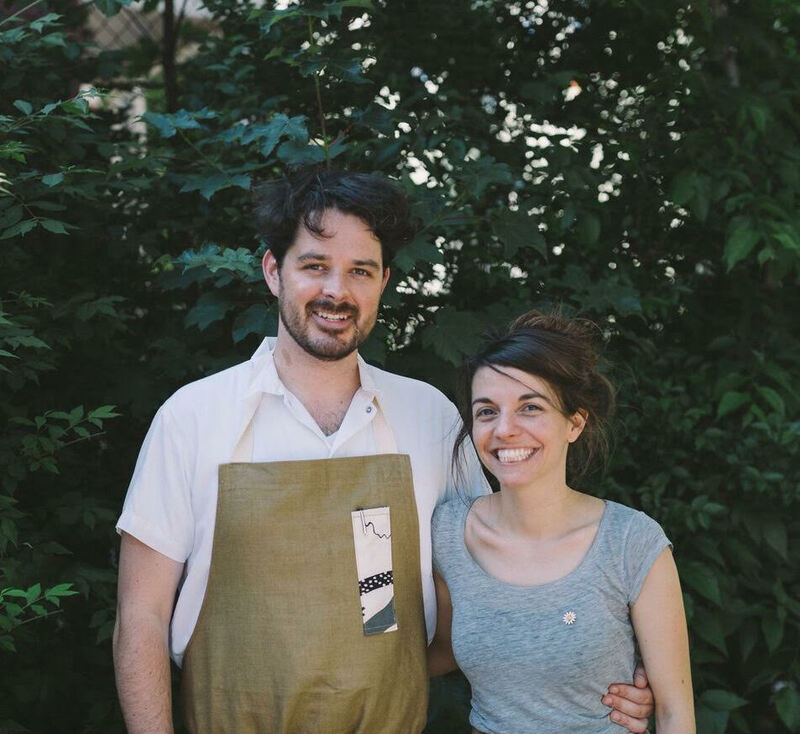 Co-owners Sara Markey and Andrew Brady place a premium on sourcing as organic as possible, but they’ll be the first to tell you that running a restaurant that way isn’t always easy. We spoke to them about their motivations, the challenges of sourcing sustainably, what organic produce you should be excited about and more. What led you to this local, sustainable philosophy for Field & Vine? Why is thoughtful sourcing so important to you as restaurant owners? When Andrew and I met, we connected through a common love and respect for nature. Andrew had been in New York City for quite some time and seen the rise of New-Brooklyn cuisine, and he was committed to the same approach of sourcing and cooking. Having grown up in Vermont, I have always had a strong connection to small farms and local sourcing. It wasn’t until I moved out of state that I realized that these virtues weren’t common practice for everyone. 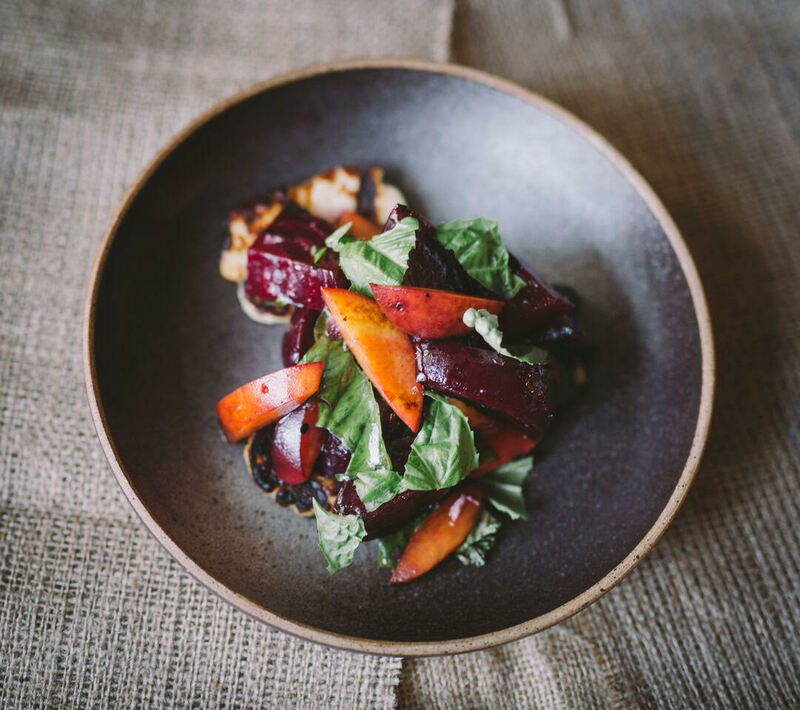 When we began daydreaming of our own restaurant, we knew our food would always reflect our shared admiration for our local farmers and our commitment to making a positive impact on our environment. What are your goals in sourcing this way? Is it to foster change in the industry or is it more personal? It’s not so much a goal to source mindfully, as it is a belief of ours. We believe in doing what we can to keep our carbon footprint down and to support local farms. We believe that if everyone does their part, this will create change. Our goal is to share this philosophy with our guests and our hope is that they pick up on the importance of it and practice it themselves. What are the challenges in sourcing organic products for restaurants? Challenges specific to sourcing sustainably? Availability and cost are the main challenges in sourcing organic and sustainable products. Some bulk kitchen ingredients, such as cooking oils, vinegars and spices aren’t available organically, and if they are the prices are extremely high and they’re not available in the quantity we look for when buying for a restaurant. This makes it really difficult. Produce and proteins aren’t as difficult, but it’s because they are produced locally. Seasonality also plays a big part in sourcing. We are restricted in our sourcing by the growing season and climate effects in regard to produce and seafood. For example, we think cucumbers would go well with bay scallops but we aren't able to put them together because they grow at separate times of year. In 2016 there was no stone fruit crop between Rhode Island and Maine due to unseasonable weather in the spring. That meant no local peaches, plums, cherries or apricots. Many restaurants went ahead and ordered from California or Florida and listed said fruit under the guise of local. These situations can be challenging for us and our customers, because certain items may be available on another restaurant’s menu and our guests might expect us to have them- but we won’t. What do you wish diners knew about what it takes to run a restaurant with a local/sustainable ethos? It takes a lot of time and creativity to run a restaurant with this ethos. In the winter months, all of the farms have very little [produce], so sourcing becomes really challenging. During this time we have to order from several additional farms to be able to receive the amount of product we need for any one given dish. This takes more time, thought and foresight. Also, with the weather playing a huge role in availability, we have to be able to think quickly and creatively about our dishes. Andrew will create a new menu item and by the end of the week it will no longer be on the menu because we can no longer source that particular vegetable. It makes his job tricky. We wish diners understood the positive impact their meal was having on the local farming community. Our greens travel less than 100 miles to get to the plate, our proteins are from New England, our cheeses are as well. Our seafood is local and sustainably caught. All of this greatly reduces our carbon footprint and in return greatly reduces our diners’ carbon footprint. The money they spend while dining with us goes to these local farms, fishermen and growers. What products are most important to buy organic? Are there any where it’s less important? Why is that? We wish would could buy everything 100% organic. Since we can’t, the items we place strong importance on are definitely proteins. We want to know that the meat we buy hasn’t been fed anything unnatural, hasn’t been pumped with hormones and that it’s been raised in conditions that don’t negatively affect the surrounding environment. It’s also important that these animals are raised in a humane way by farmers who care about their welfare. Why is sourcing organic so expensive? The certification required [for a producer] to be 'organic' and the price of farming without pesticides and insecticides dictates higher prices. Also, these farms usually operate on a smaller scale making it very difficult to be competitive with more conventional, industrial operations. What factors other than organic should consumers look for when buying produce or going to a restaurant if they’re looking to support good environmental practices? This is a great question. Consumers who want to make a difference should be shopping at local farmers markets or the farms themselves. There is no substitute. Even grocery stores that claim they are local usually fall short. If the consumer shops at the local market, they will be able to turn their experience into knowledge about what’s in-season, which will in turn inform their decisions when ordering at restaurants. Proteins can be more challenging. We recommend small butcher shops and fish markets- and to always ask questions! Know your farmer. What organic or sustainable products are you most excited about right now and why? We’re excited about bay scallops! These succulent little treasures are only available from the winter to the early spring and they are a true delicacy. We have them on the menu raw with local apples and we can’t get enough of them. Something else we are excited about is natural wine. So many producers are committed to farming organically - biodynamically and with minimal additives or intervention. The vast majority of our wine list is dedicated to these producers. We love these wines for their authenticity, individuality and courage. They share a philosophy rooted in place, honored by time and grounded in a respect for Mother Nature. This, to us, makes the whole dining experience a little more complete. What other restaurants in the area are doing a great job featuring local, organic or sustainable foods? There are so many restaurants in our area that are committed to sourcing mindfully. Bondir comes to mind immediately. We saw Tony Maws (Craigie on Main/Kirkland Tap & Trotter) at the farmer's marketing Union Square almost every Saturday this past summer. Kate Stambaugh of Toro was usually there as well. Dan Amighi of Cafe du Pays always has the best sourced beef around. Nicco Murratore (Commonwealth Kitchen) has a serious larder of preserves and is an accomplished forager as well. Our friend and podcast host Nevin Taylor (Asta, Tres Gatos and grill man at Field & Vine) is always getting deep into local ingredients - this year he took on black walnuts and cider making from locally wild foraged apples. (More info at www.nevintaylorcooks.com). We realize we are in no way trendsetters. We consider ourselves lucky to have come up in the industry at a time when this movement is so prevalent. Some of our mentors had a far more difficult time sourcing this way. Ten years ago in Somerville we wouldn’t have had the resources we do today - and while there are still challenges, more progress is being made with every passing season. In our six months of being open we’ve had a great deal of guests who understand and appreciate what we are trying to do at the restaurant and that makes us really happy. We are really scared about our climate, about the shrinking amount of preserved lands, about the preservation of small family farms and the danger of the growing industrial food complex. Our main hope is that this movement transforms from a trend into a commonly practiced way of life. We think all people and the planet would be really happy with that.